This past Sunday, 9th of April, I took a late trip down to Tucson. An American Bittern was being seen at Sweetwater Wetlands and this was a bird that I've been wanting to see and photograph. I also wanted to try and see an Olive Warbler and an Elf Owl, all of which were in the Tucson area. Despite reports of it being out in the open on the listserv, there was no sign of it during the 90 minutes that I stood around (sometimes in a tree so that I could see over the reeds) but I managed to see some good birds anyway. 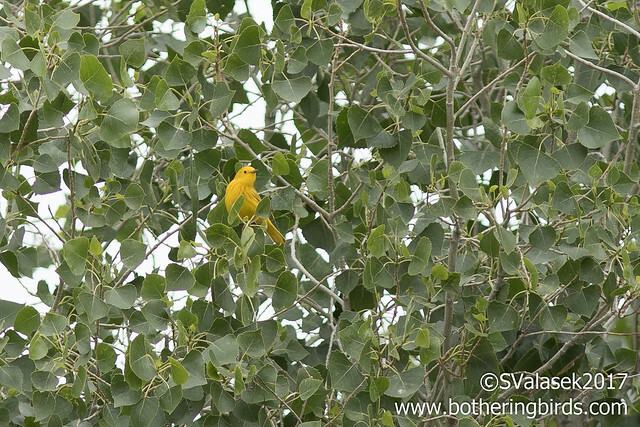 There were so many Yellow Warblers around, I reported 7 but there could have easily been more. 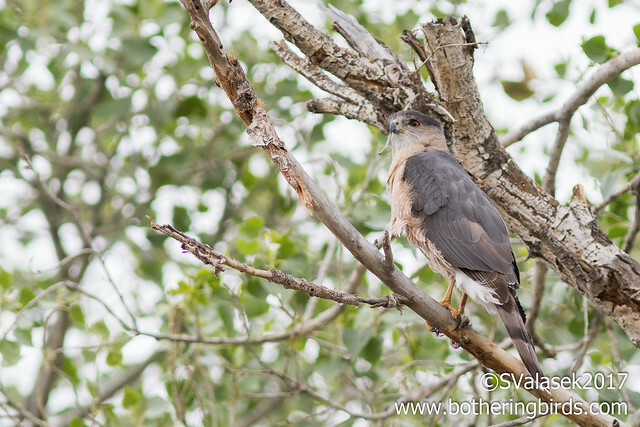 Again I saw a Cooper's Hawk in nearly the same tree as last time, near the Gazebo. But this one had no rings. And notice the furry mess at it's feet. 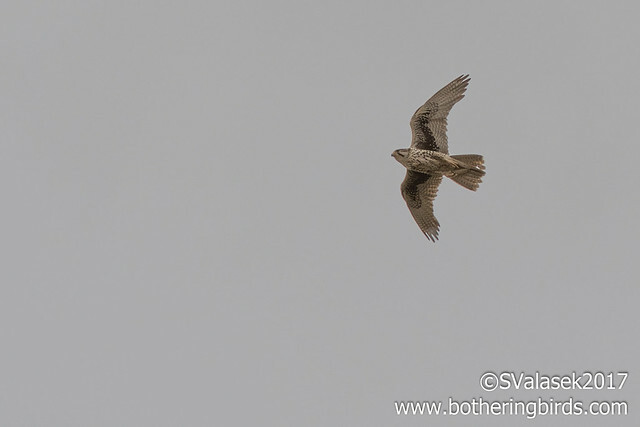 And a brief flyover of a Prairie Falcon (which I thought was a Peregrine until I got home). I left Sweetwater Wetlands with no AMBI and had a quick lunch at Illegal Pete's in Tucson. I looked over the Finding Birds in Southeast Arizona guidebook and the Birdseye App on my phone to try and determine where on Mt. Lemmon I should concentrate my limited time up there. I decided on Rose Canyon Lake with stops at some lower picnic areas if I didn't have any luck there with Olive Warblers. 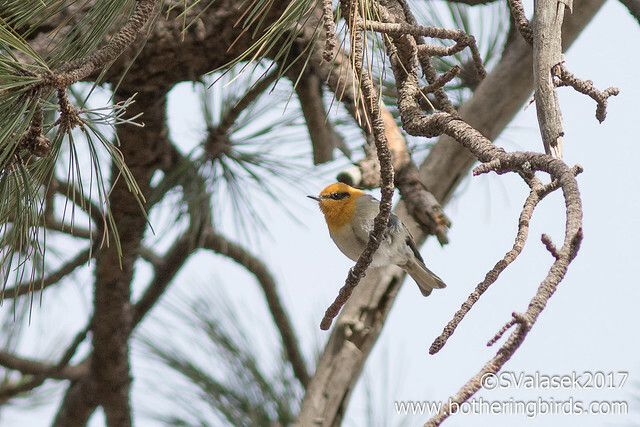 There was also the added bonus of a potential life Buff-Breasted Flycatcher in the same area. But when I got to the turn-off to the lake, it was closed due to fire. I decided to continue up instead of down and stopped at Incinerator Ridge Road. I parked at the gate, as recommended by the guidebook, and started walking up. I shortly heard some Common Ravens making some low calls and then saw a few Yellow-Eyed Juncos along the road. And then a Steller's Jay flew by me and downslope. I ran into a couple from Connecticut who were birding. They mentioned seeing Olive Warblers at the top of the road and down a nearby trail. I continued on my way and ran into some Western Bluebirds with some very vibrant colors with some Pygmy Nuthatches nearby. I found the trail at the top and kept on going. Shortly after I noticed a small bird fly into a pine tree above me and quickly got it in view with my (new) binoculars. It was a warbler with an yellow-to-orange head and breast, dark eye-line and white wing bars: OLIVE WARBLER! I've been hoping to see one of these birds from the time I lived in New Mexico. I turned and walked back down towards my care elated at finally ticking this bird (and getting my first lifer in what felt like forever). I passed back through the Western Bluebirds and was just about half-way down the road when some activity to my left got my attention. I noticed a few small birds that quickly became a mixed-flock working their way through the trees. 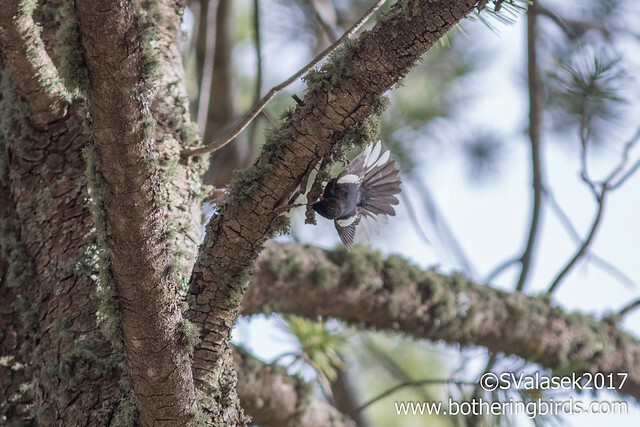 I saw a Mountain Chickadee, Grace's Warbler, White-Breasted Nuthatches, Ruby-Crowned Kinglets, another Olive Warbler and a Painted Redstart, which was flying all around and displaying while it foraged. I tried to get some photos of the other birds, but they were too busy and the light was bad. 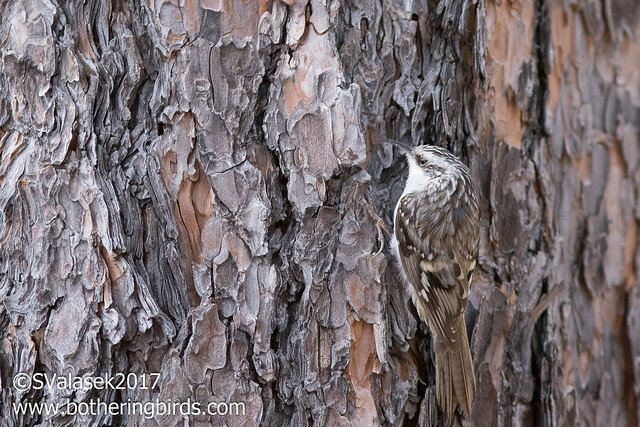 But I heard some Brown Creepers and quickly spotted 2 of them working their way up some trees. By the time that I made it back to my car, I had enough time for one more stop. Despite being fairly tired, I wanted to stop by Catalina State Park in nearby Oro Valley to try and hear some Elf Owls. I made it there just at dusk and parked at the trailhead for the birding trail. It was quite busy with people leaving but eventually I was the last person there along with a few cars. I didn't know if a gate was going to be closed trapping me in, but I thought that I would take my chances. It wasn't fully dark when I heard a deep "hoot-hoot-hoooooot" coming from the west. 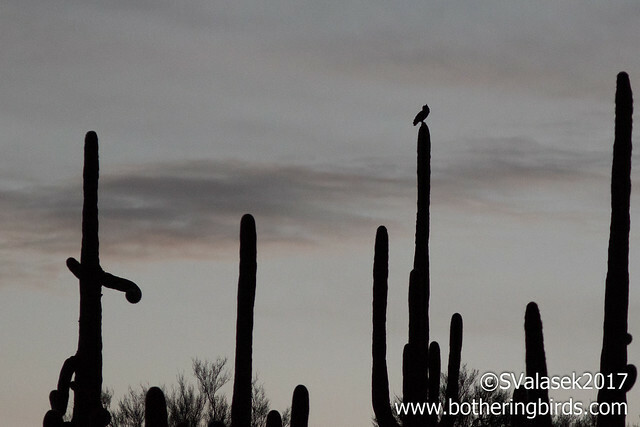 I scanned the tall Saguaros until I saw the culprit, a male Great-Horned Owl was calling away. As it got darker I heard a higher-pitched and more rapid hooting from south of me. Going against my better urges, I headed off into the trees and followed a trail as the sound got louder. I eventually passed where it was coming from and turned around. 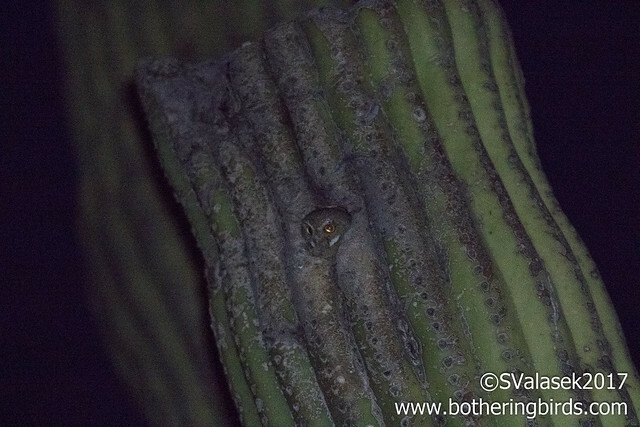 Somehow I noticed a glint of eyes coming from a nearby cactus in the light of my headlamp. It was a tiny Elf Owl calling away. I got a bit closer, and using my headlamp, and maxing out the ISO of my camera, I managed to get a shot if the owl! Another lifer for the day and a bucket list bird for sure. Despite dipping on that darn Bittern it was a great day. I managed to add 2 lifers and get an amazing hand-held shot of an Elf Owl.